Last weekend, Chaos Created was at Kapow! Comic Con in London. It was great meeting everybody – thanks to everyone that came and said hello and hugged our zombie! In between all the game playing and eating lots of American candy, we did announce a few things too! 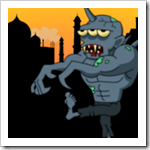 We created a spin-off of Zombies Ate My City so that international users can get in on the zombie slaying fun! In this sequel, players need to defend the Seven Wonders of the World from Klada and his zombie hordes. The story of Professor Klada continues through video cut scenes and introduces a more arcade-like game with multipliers to challenge players through seven increasingly difficult levels. Players must complete each level, working their way through waves of zombie hordes to progress and defend the next wonder. Achieving a gold score unlocks new weapons to make slaying zombies a little easier. Zombies Ate My Wonders is available on Windows Phone now! Read more about this over on the ZAMC web site. 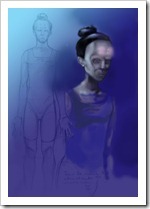 Coming in early June is the next chapter in the Timedancer universe. 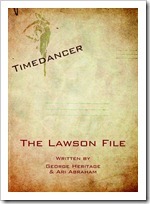 In this modern take on the classic Choose Your Adventure gamebooks of the 1980s, The Lawson File runs alongside Episode 1 and Episode 2 but tells a standalone story based around the Timedancer Corporation. Set in the years prior to the Timedancer Corporation making time travel tech available to the masses, The Lawson File tells the stories of Nicole Maniere, Ethan Sullivan and Billy Metcalfe. It chronicles how their lives are manipulated by the mysterious Tempus, owner of The Timedancer Corporation, for his own agenda. Choose with characters to follow and make decisions – you can read The Lawson File over and over, making different choices to take in the whole of this Timedancer story. The Lawson File arrives on Amazon Kindle on June 4th. More details on the Timedancer web site. Earth.0 is a new transmedia story that we are working on with creator Yen Ooi and writer, Ari Abraham (Zombies Ate My City, Timedancer). An epic science fiction story that spans over a millennia, it is about a mutated earth, where a population of highly intelligent humans live in a peaceful darkness and strive to perfect their genetic code for survival. The journey begins now from the depths of Professor Hathaway’s need to respond to the issues facing humanity today. The story develops through three epochs with mystery, adventure, space travel, action and emotion. Chaos Created will be creating web sites, apps and games that will help tell the Earth.0 story. The first part of this story will begin in August 2012. More details on the Earth.0 preview site. So, lots of exciting stuff from us over the coming months! Check out photos from Kapow! and Chaos Created here. And check out our fans meeting Horace the Zombie here! Keep checking back for the latest news and thanks for supporting us and our projects!